CLARIN-PLUS workshop "Facilitating the Creation of National Consortia: Repositories"
The goal of this workshop is - in line with the CLARIN-PLUS series “Facilitating the Creation of National Consortia” - to share experience and know-how about development, deployment and sustainably providing as a service repository systems that are a crucial part of CLARIN B-centres. This CLARIN-PLUS workshop “Facilitating the Creation of National Consortia: Repositories” is hosted by The Institute of Formal and Applied Linguistics at Charles University in Prague. FLAT: New setups in Netherlands, Github, knowledge sharing, etc. For finding suitable accomodation, we suggest you to visit: booking.com, where you can easily find nice, rated, cheap accommodation near the event venue. Currency: Czech crowns (CZK, Kč), it is approx. 27 Czech crowns for 1 euro. Bus #119 to Nádraží Veleslavín - Metro Line A (17 minute ride). Departures every 5-20 minutes from 4:23-23:44. Bus #100 to Zličín - Metro Line B (18 minute ride). Departures every 12-30 minutes from 5:41-23:36. Bus #191 to Petřiny - Metro Line A (24 minute ride) and metro B Anděl (48 minute ride). Departures every 24-40 minutes from 4:57-23:11. Night Bus #510 going via Arbesovo náměstí (36 minute ride) and I. P. Pavlova (42 minute ride). Departures from the airport every 30 minutes from 23:57-3:57. 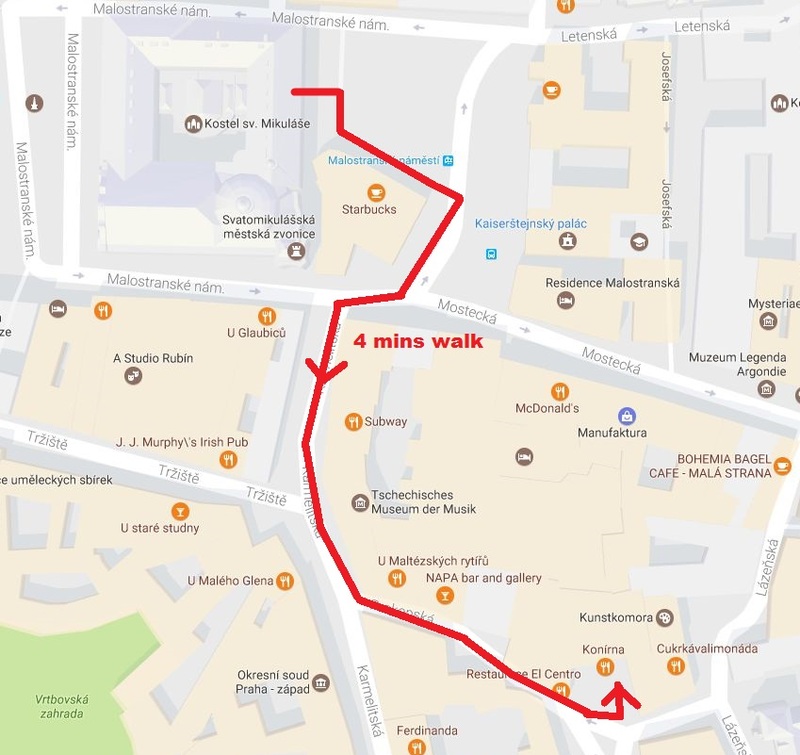 To get to Malostranské náměstí (Venue of the Event), the best option is to take bus #119 from the airport to its terminal stop Nádraží Veleslavín. From there, you can either take tram #20 that goes directly to Malostranské náměstí, or – which may be a little faster – you can take metro to station Malostranská and from there tram #12, #15, #20, or #22 to Malostranské náměstí (one stop). Taxis cost 400–800 CZK to the city center. Fix Taxi and AAA Taxi have exclusive contracts with Prague airport. When you buy your voucher from the taxi stand, you will get a coupon for 20% off of the cost of your trip back to the airport. Prague has a well developed and reliable public transport, with the following prices for tickets, which are valid on buses, metro, and trams. You can buy tickets in slot machines in the underground stations, in most newsstands, specialized public transport shops, Prague transport information centers at the airport and the main railway station. You can change between the buses, metro, and tram for no additional charge as long as your ticket has not expired. Remember to validate your ticket as soon as you get on the bus/tram or in a metro lobby by sticking it into a yellow machine with a green glowing arrow, or you may be subject to a fine of 800 CZK if you are caught. Each type of ticket should be validated only once – the first time you start to use it (never when you change).